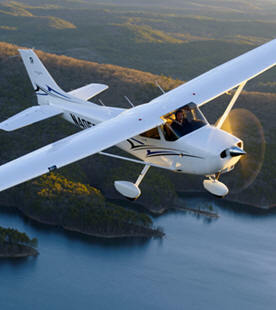 September 15, 2013 - Cessna Aircraft Company announced an order for 79 Cessna 172 Skyhawk aircraft, one of the largest orders on record for the aircraft, at Moscow’s JetExpo 2013. The Cessna 172 Skyhawk is high wing, four seats, single engine general aviation aircraft made by Cessna Aircraft Company. The aircraft was first flown in 1955, more Cessna 172s have been built than any other aircraft. Moscow-based ViraZH, plans to use the Skyhawks for training purposes at various flight schools throughout western Russia. The order is part of a multi-year agreement between Cessna and ViraZH, with all 79 aircraft set to be delivered by the third quarter of 2014.On completion of the final delivery, ViraZH will have one of the world’s largest fleets of Skyhawk 172 aircraft in operation. The 172 Skyhawk has become the best-selling, most-flown single-engine aircraft in the world. With an all-glass Garmin G1000 integrated flight deck, the Cessna 172 Skyhawk has earned a reputation for offering the best combination of modern features and proven dependability among general aviation aircraft.